﻿ Signé Couture by HAYARI Paris: The perfect wedding dress for the journaldesfemmes.com 's mariage section!! Signé Couture by HAYARI Paris: The perfect wedding dress for the journaldesfemmes.com ‘s mariage section!! 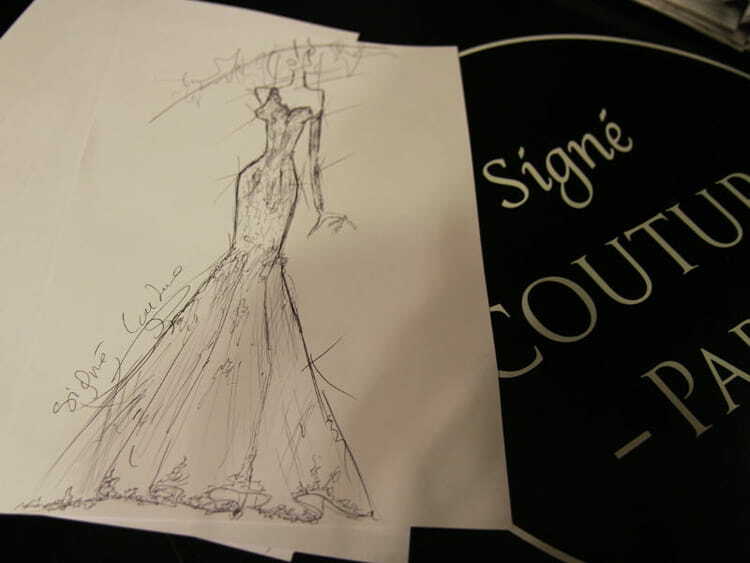 Last 5th and 6th of October, at the Mariage au Carrousel‘s exhibition in Paris, the Fédération des créateurs parisiens en couture sur mesure, who have launched the label Signé Couture, offered brides-to-be the opportunity to have their dream wedding dress drawn before their eyes!! 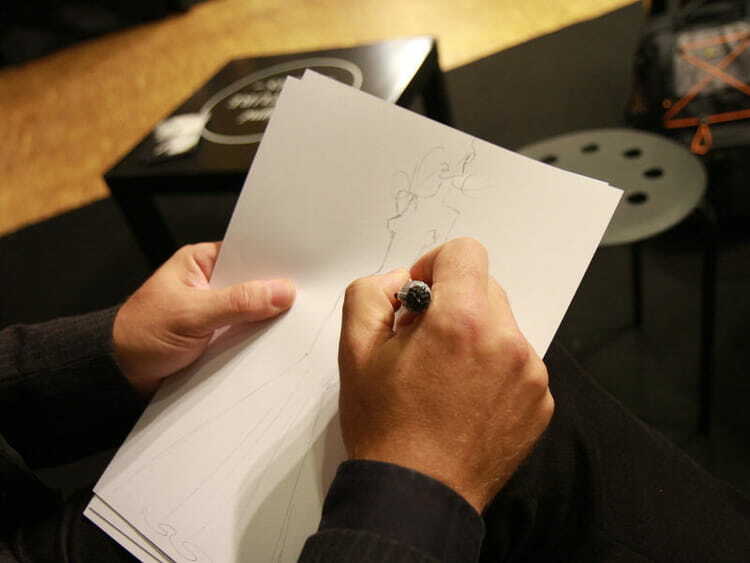 The Mariage section of our magazine could not miss this chance and we asked Nabil Hayari, from HAYARI Couture Paris, to sketch our perfect wedding dress!! 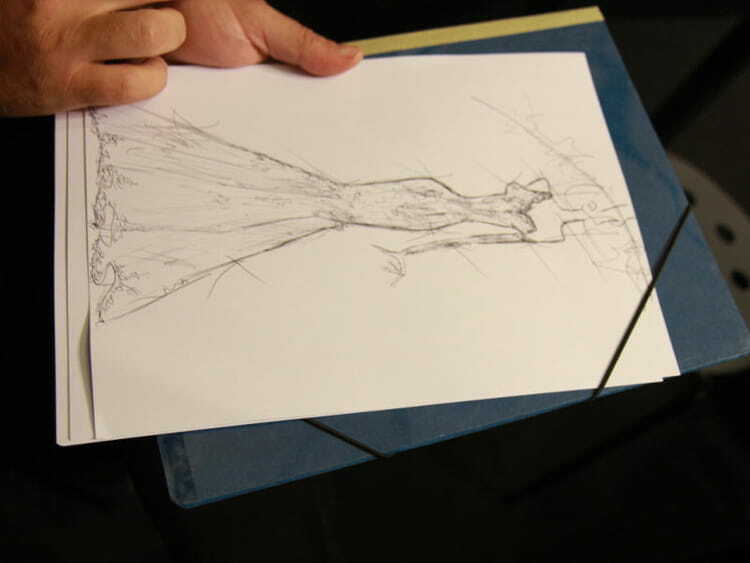 Because, most often, the desires and wants of a bride-to-be do not all combine elegantly, Nabil Hayari started with what is called a “rough sketch”: The designer makes choices amongst the bride-to-be wish list to capture the spirit of the dress and adapt it to her features. 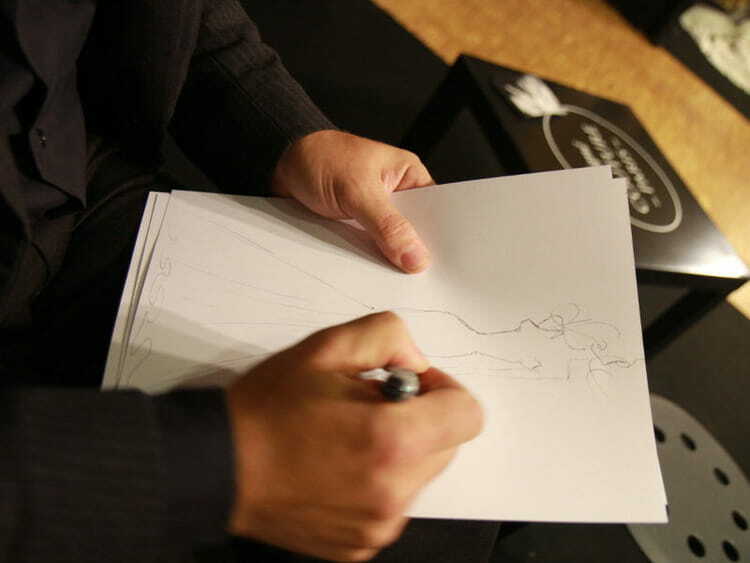 The “rough sketch” is drawn within minutes to summarise the style of the dress and meet the bride-to-be’s first expectations. 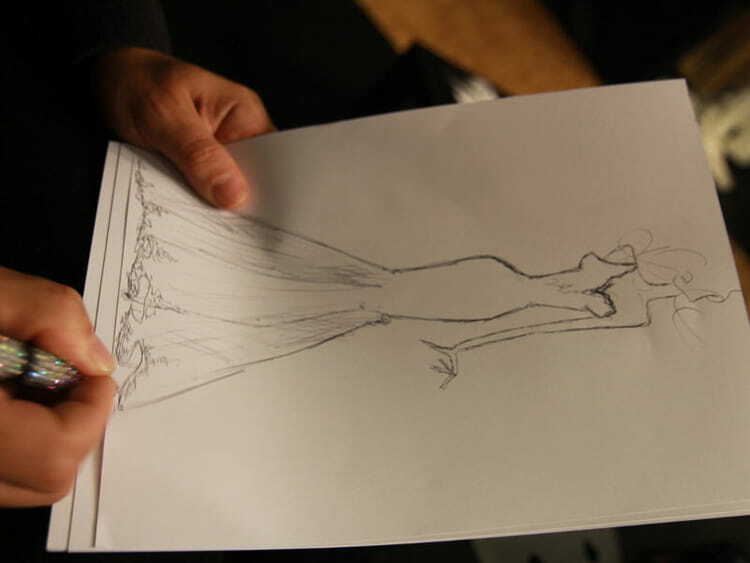 Many sketches exploring the details of the dress, will follow, until the colouring stage of the final drawing. Only then will the bride-to-be made-to-measure canvas mold be made, in full respect of French haute couture’s traditions and savoir-faire!! Chantilly lace was added to the bottom of the dress to achieve a vintage look. A wonderful mermaid wedding dress which combined elegance with a vintage look in a swirl of laces lit by Nabil Hayri’s ultimate touch! 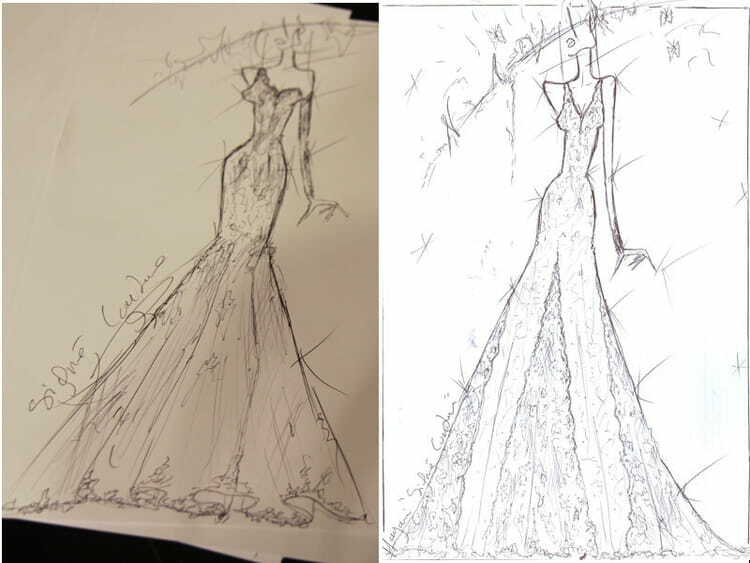 Nabil Hayari also drew a second version of our dress: extra chantilly lace and 2 fine embroidered straps leaving the arms bare… We loved both and just couldn’t choose!! 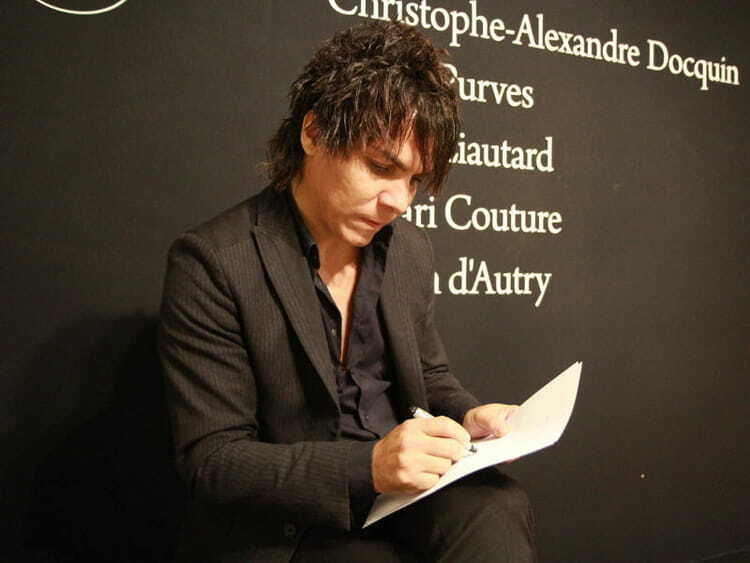 Nabil Hayari is a member of the Fédération des couturiers parisiens eu couture sur mesure, which launched the label Signé Couture in april 2011. The federation aims at preserving French Couture’ savoir-faire and traditions, while promoting Parisian couture designers on the national and international scenes. Members of the Federation: Ateliers d’Organse, Catherine Alhinc, Christophe-Alexandre Docquin, David Purves, Fanny Liautard, Hayari Couture et Martin d’Autry.